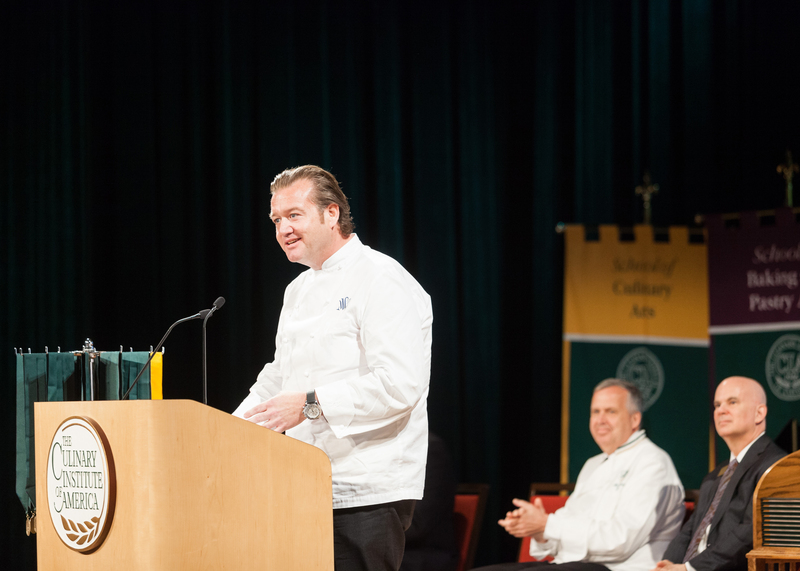 Hyde Park, NY – Michael White, chef and owner of New York City-based Altamarea Group, was keynote speaker at graduation ceremonies at the New York campus of The Culinary Institute of America on April 13. The Altamarea Group includes 15 highly acclaimed restaurants in four countries. Its flagship, Marea in New York City, holds two stars from the Michelin Guide, won the James Beard Foundation Award in 2010 for Best New Restaurant, and was rated the number one Italian restaurant in New York City by the Zagat Survey for four straight years. Chef White also earned a Michelin star with Ai Fiori in midtown Manhattan. In addition to restaurants in New York, New Jersey, Pennsylvania, and Washington, DC, Altamarea Group opened Al Molo in Hong Kong, The Chop Shop in London, and Ristorante Morini in Istanbul. The company also runs the food and beverage operations for the Bedford Post Inn in Westchester County, a Relais & Châteaux property co-owned by actor Richard Gere. Chef White is a five-time James Beard Award nominee for Best Chef: New York City. He is the author of Fiamma: The Essence of Contemporary Italian Cooking and co-author of Classico e Moderno: Essential Italian Cooking. The entire graduation ceremony, including Chef White’s address to 69 recipients of CIA associate degrees in culinary arts and baking and pastry arts, can be seen online.